Posted Feb 11, 2019 by Eds. Their recent actions are an example of lawfare, which must be carefully considered. While all the coup actions taken by the opposition are unlawful, this will not deter those intent on Venezuela’s destruction. We have only to look to Brazil to understand the peril. As has been pointed out many times, there is a steady usurpation of international law by U.S. and NATO nations that are gradually replacing the “rule of law” with “rule based order”. Essentially what this means is that any nation that seeks to act outside the parameters of international law, creates new rules that, when unopposed, establish precedents that eventually weaken and supersede international law. And this pattern is also observable at national levels operating within the US-backed coup d’état milieu. While the Venezuelan government has declared the transition status being used by the opposition to justify military intervention null and void, this is not enough to ensure it is defeated. All of this was done outside Venezuelan law, just as all U.S. and EU actions are simultaneously violating international law. And while these coordinated unlawful actions continue, aside from verbal condemnation, no major power is taking these nations to task for their transgressions at either the United Nations or the International Criminal Court. As a consequence, these rogue nations and their minions are not only emboldened, but are being tangibly enabled by the international community as they operate in all spheres with absolute impunity. On February 4, twelve days after Juan Guaidó’s self-juramentation, the National Assembly held an ordinary session to discuss and approve an instrument called “Statute Governing the Transition to Democracy to Restore the Validity of the Constitution of the Bolivarian Republic of Venezuela. It is an eighteen-page document, with thirty-nine articles, preceded by a Statement of Motives with five recitals that has been catalogued by public opinion as a new “Carmona Decree“. In its article 2, “transition” is defined as “the itinerary of democratization and re-institutionalization”. It determines that a three-phase process has been initiated that will be necessary before calling for supposed free elections. The language used does not correspond to that of the 1999 Constitution, using the categories of the 1961 Constitution and erasing the Bolivarian character of the Armed Force and the protagonist participation of democracy that they understand as a space of political parties. Within this framework, the “statute” seeks to reverse decisions that were taken in a sovereign manner in recent years, with particular emphasis on “fully reinserting the Venezuelan State” into the OAS regime and its human rights bodies. They then characterize the current situation in Venezuela. In the social as a “complex humanitarian emergency” and in the political as a de facto situation derived from a “usurpation of the National Executive Power”, on which they estimate they can determine the nullity of the acts of all the Public Powers, including the Electoral, the Citizen and the Judicial. This being their assessment of the country’s situation, they state in Article 11 that all citizens must follow the regime they are determining and that all officials will be responsible for “contributing to usurpation” if they recognize the rest of the Public Power and execute their rulings. On this subject, already discussed in his amnesty project, we have referred to this in detail. The Statute reaches Chapter III in which it grants the National Assembly all the powers of the National Public Power. Without indicating terms for the exercise of the same and breaking the scheme of separation of powers provided for since the original Magna Carta of 1811. Thus, they design a Legislative Power that accumulates the competences of the President of the Republic and the Legislative Power, that represents the Republic internationally and that has all the competences over the patrimony of the Republic without the existence of a comptroller body that they recognize outside this enclosure. This implies the complete annulment of the Citizen Power and the Judicial Power, which in principle do not form part of that assumption that generates the dictation of a “transition” and that had also been replaced by the National Assembly in 2017. 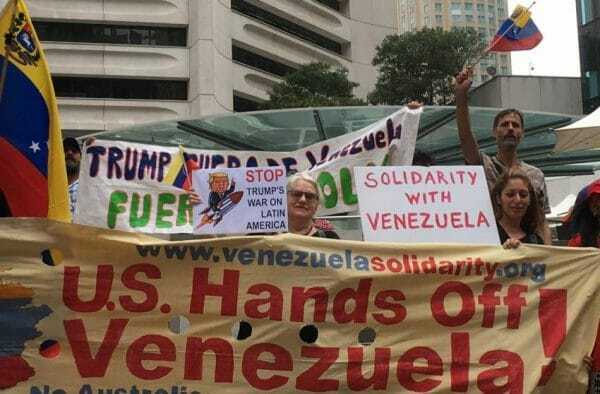 According to the Statute, decisions regarding Venezuelan oil have their centre in Washington, at the same time as the permanent demand for international aid–in light of Guaidó’s latest declarations–seems to see that foreign intervention is a situation desired by those who subscribe to this document. The deadlines for this situation to persist are completely random. When we refer to the documents of the National Assembly, we are not talking about a law of the Republic. For a simple reason: for an instrument in Venezuela to become law, it is required to have followed the legislative procedure provided for in Article 202 of the Constitution. In other words, it must have been submitted to two discussions before being sanctioned and then promulgated and published by the Executive Branch. In addition, until the National Assembly’s disregard for the Supreme Court ceases, all of its decisions, acts of political control or sanctioned laws are null and void. According to the Statute, it is an “act in direct and immediate execution of Article 333”. This norm does not provide any mechanism to dictate a legal order but the fact that disregard of the Constitution does not make it lose validity and an invitation to all the authorities to impede, stop or amend a constitutional violation. For these reasons, it is difficult to legally categorize the nature of an instrument that is not provided for in our Constitution and that constitutes the separation of a sector of the National Assembly from the logic of the Venezuelan State, which determines that the five powers are equal, that political conflicts are resolved within the framework of the Constitution and that Venezuela is constituted as an independent Republic. Can a National Assembly ignore the Constitution that determines its existence and functioning? Undoubtedly not because the Constitution is the supreme and constitutive norm of the entire National Public Power. A Constitution can be interpreted and this is what the Constitutional Chamber does and its rulings must be applied by all powers and finally complied with by all citizens. But none of the powers can erase the content of the Constitution, reformulate the functions of the branches of power or change the character of democracy or existing rights. This document is produced by assuming powers that only correspond to the National Constituent Assembly and that are solely the decisions of this instance, which must be complied with by the entire National Public Power without the right to opposition, in accordance with the provisions of Article 349. It is thus confirmed that since at least 2016 the opposition has resisted entering the political arena under the terms of our legislation. According to his Statement of Motives, “during twenty years of the Bolivarian Revolution, a political system far removed from constitutional principles has been imposed”. Something totally false: first the Constitution arrived and then, at the request of President Chavez, it went to the National Constituent Assembly that dictated the current Constitution. They then point out that their actions are framed in a “liberating conjuncture” insofar as President Nicolás Maduro Moros “was not elected, was not sworn in and clung to the Executive Power in a factual manner to deepen usurpation”. Similarly, according to this text, in Venezuela there have been no elections or at least these are flawed of nullity for having been summoned by the National Constituent Assembly. Another falsehood: according to article 349, what the ANC orders must be complied with by all powers. Moreover, things did not happen that way. Let’s quickly see which was the road that brought us to January 10. In the first place, the “Constituent Decree on the convocation of the Elections for the Presidency of the Bolivarian Republic of Venezuela2 was pronounced, published in the Extraordinary Official Gazette N°6361 of January 23, 2018, in which the National Constituent Assembly, exercising its supreme power and preserving the interests of the Republic, summoned “for the first four-month period of 2018, the electoral process for the election of the Presidency of the Bolivarian Republic of Venezuela”. This order was subsequently modified on March 1, 2018, by means of the “Constituent Decree on the Call for Elections in the Bolivarian Republic of Venezuela”, published in the Ordinary Official Gazette N°41351 of the same date, by means of which it modifies the date for the celebration of the elections postponing it to the month of May of that year. Obeying then the National Electoral Council and proceeding to invoke them, as has occurred in all elections since August 2017. Additionally, it can be verified in the official website of the National Electoral Council, that in the Bolivarian Republic of Venezuela presidential elections were held on May 20, 2018 in order for the people to decide, through the vote and in accordance with the provisions of Article 228 of the National Constitution, who would assume the Presidency of the Republic for the constitutional period 2019-2025. For these elections, 20,526,978 Venezuelans were legally authorized to vote, 9,209,777 people did so, and Nicolás Maduro Moros was the winner with a total of 6,248,864 valid votes. Which, for the purposes of this “Statute” do not exist or their vote must be discarded in the face of an abstention that they understand to be made up of people who decided not to vote so that Nicolás Maduro Moros would not be president. This crazy assertion omits that in Venezuela elections are won only with votes and that no political analyst can argue that abstention in its entirety means that those who did not participate favored some option. There are people who never vote, others who were not in the country and others who simply did not want to do so. Finally, the Statute and other instruments were adopted in sessions where there are serious questions about whether the regulatory quorum has existed and that because they do not comply with article 202, they are not laws of the Republic. It is, therefore, something much more dangerous than the Carmona Decree that attempted to order a de facto position, since they are intended to be read abroad as a framework that demands and justifies intervention.